This is a general privately guided Cultural and photographic Venda tour that can be incorporated into a bigger South Africa tour. Venda is close to Kruger National Park,so that becomes a easy add on for a South Africa Safari experience. ****This trip outline is subject to change as we may discover a traditional wedding, feast,and other activities as we travel…. On the way stop over at Mukondeni a very special village where most women still practice the traditional way of making pottery. Arrive Thohoyandou the capital of the former homeland Venda. Accommodation at a local hotel. 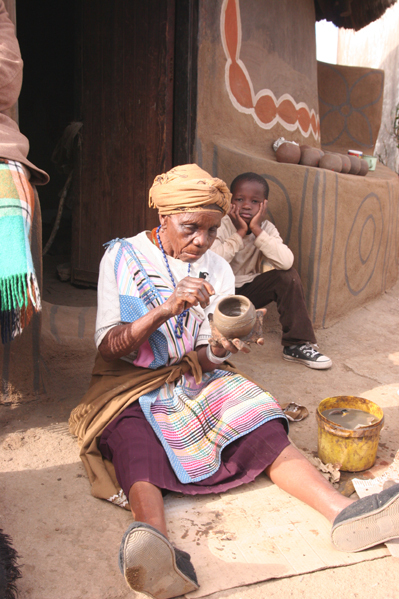 Sarah 92 the old sage of Venda Pottery. A day-trip to the heartland of Venda passing Tshatshingo Potholes as well as the Holy Forest and Sacred Lake Fundudzi. Lunch will be taken at the house of a teachers family. Local specialties like “Mopani worms” and traditional beer can be tasted and a visit of the nearby school can be arranged. Its here where the combination of a cultural and photographic Venda tour becomes real,as we in a very remote area,with beautiful scenery,experiencing the Venda Culture. The tour comprises rich African mythology and folklore,personal experiences and stunning views that will make a photographers heart miss a beat. Visit the royal homestead of the living King Kennedy Tshivhase. The ancient stonewalls are reminiscent of the culture of “Great Zimbabwe” and it is far from a “palace” as African Kings are not to be richer than there subjugates. The role of the traditional leaders in the New South Africa will be highlighted followed by a relaxing walk through the village where stops will be made at private homesteads to get an idea of life in poor rural farming communities. On the way back to Polokwane pop in at Noria Mabasa’s private homestead and gallery.She is a world-renowned woman artist who is famous for her giant size wood sculptures.